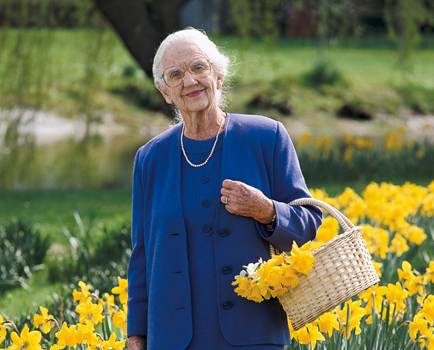 Dame Elisabeth’s upbringing taught her to love gardens and the land. As a young wife and mother of four, she found herself running two large gardens in Melbourne and at Cruden Farm. Neither property had a good water supply so she would wake at dawn — a habit that never left her — to pump water and shift hoses, or she’d water at dusk after she’d done a day’s work in the city. Dame Elisabeth was frequently in town attending appointments, meetings and performances. She served for 33 years on the Board of the Royal Children’s Hospital, she was the original Patron of the Australian Garden History Society, a Trustee of the National Gallery of Victoria, the convenor of Como’s gardening committee, a member of the Maude Gibson Trust and Chairman of the Victorian Tapestry Workshop’s Interim Committee — amongst many other important community roles that she devoted numerous hours to. Everyone who knew Dame Elisabeth commented on her extraordinary physical energy and her get up and go attitude to everything she was involved with. One of her greatest passions however was Cruden Farm.